A "space cannon" scheduled to fire a metal bullet at an asteroid in 2018 has been successfully tested, according to press reports. A spokesman with the Japan Aerospace Exploration Agency's (JAXA) told AFP that the Hayabusa2 project, set to carry the cannon into space, "is progressing as planned." The Hayabusa2 project follows in the line of another probe of the same name. 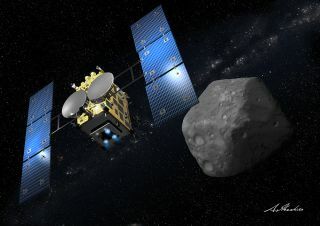 The original Hayabusa mission collected dust from an asteroid, returning to Earth in 2010, but now JAXA scientists are hoping to use the space cannon to get a better look at the interior of a space rock.